Marianne Lovink’s sculptures are hybrid forms, developed through her interest in exploring the juncture of art and science, a place where fiction meets fact. The works in this exhibition, Counterpoint, were developed through the artist’s experimentations with new materials and construction techniques. Lovink’s cut, bent and assembled structural elements, emphasize the linear aspect and the vital play of positive and negative light and shadow, always a signature element of her work. Each piece began as a formal investigation into line and space, without any preconceived ideas, to allow for the intuitive and sometimes random outcomes to dictate the final configuration. They hint at the whimsical, the architectural and the natural becoming unnatural. The linear movement in her new work combined with modernist pops of color give the viewer an additional taste of Lovink’s skill in giving engaging and fresh three dimensional form to her intuitive explorations. Marianne Lovink has been a sculptor since 1984, based in Toronto, ON before her move to Philadelphia, PA - where she currently resides. 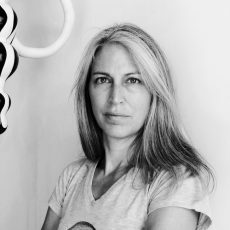 Lovink has been represented by the Kostuik Gallery since 2000 and has exhibited her work extensively in public, non-profit, and commercial galleries and been the recipient of numerous municipal, provincial and federal arts council grants. Her work is represented in both public and private collections, including those of the The Canadian Consulate, Agnes Etherington Art Centre, Osler Hoskin and Harcourt; OMERS; City of Richmond Hill; Atlantis Films Canada, and University of Saskatchewan. In 2003 Lovink completed a large scale site-specific 11 ft. x 11 ft. commission from her thermoplastic Hanging Garden series for the Drake Hotel in Toronto, and in 2006 was short listed in the top Three of a London, UK based Sculpture competition. In 2010, she was commissioned to create a large-scale outdoor welded steel work to beautify the Lansdowne Fence Streetscape by the Toronto Transit Commission and was chosen to design the bicycle stand up locks by the City of Toronto in 2011. Lovink is an Associate Member of the Royal British Society of Sculptors. Kenderdine Art Gallery, University of Saskatchewan, Saskatoon, Sask.